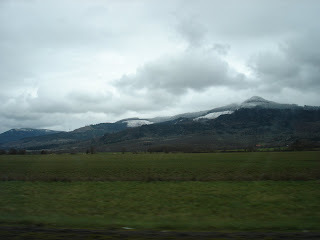 The drive to Grants Pass, OR ended up being really nice. It was like a four hour drive, but it was a bit longer trying to leave Portland, due to a little bit of a rush hour, and there was a pretty bad accident on the other side of the road. We stopped pretty damn close to being in California. Notable sights include d lots of fields that seemed a bit greener than is natural with countless sheep grazing. It definitely had an Ireland sort of look to it that I didn't expect to be out here. The farther south we traveled, the less flat the terrain became. The occasional vineyards were even visible. A few hills in the distance turned into all kinds of sharp turns and steep climbs in the road. The speed limit was constantly changing, and the road was a bit slick... definitely a highway that commanded constant attention. There were all kinds of trucks with logs being towed. I imagine such a jagged countryside isn't good for much other than lumber. The mountains started to get tall enough that the tops were still covered with snow. Grants Pass itself ended up being a decent sized place. I had assumed that it was going to be barely hospitable due to the mountains, but they had a mall or two even from what I could see. Since it was only a branch of the main business, we were done working there in less than an hour. Then, it was lunch, and back on the road for another 4 hours. Pretty exciting.